It wouldn’t just be a dream scenario for the Spurs, it could be the best thing for both James and the league … of course, that doesn’t mean we’ll see it. With a relatively uneventful free agency season winding down, it’s natural to cast at least one rose-tinted eye to next summer. It is, after all, what the Spurs front office may be doing these days. While some teams swung superstar deals this year, and even more committed significant long-term money to bolster their rosters, the Spurs calmly, Spursily stood pat. They rescinded their qualifying offer to Jonathon Simmons, letting him go to Orlando on a perfectly reasonable three-year contract, and did little else beyond kick a few tires on mid-tier free agents like George Hill and Andre Iguodala. The Patty Mills and Rudy Gay signings represented an effort to remain competitive, but both were value moves that are both understandable and, more than likely, movable if necessary. The result: San Antonio could be one of only a handful of teams with major cap space in 2018, and possibly the only contender able to spend. Accounting for player options for LaMarcus Aldridge, Danny Green (both of whom should be expected to decline at this point) and Gay (less certain, depending on his recovery from Achilles surgery), Joffrey Lauvergne’s contract details, and what happens with Pau Gasol, the Spurs could have less than $40 million on their books come next summer. Even if circumstances change with a few of those guys, they’re poised to chase whomever they may want to pair next to a beginning-his-prime superstar in Kawhi Leonard. Next year’s free-agent class includes a number of stars, but one stands out above all others, a name we could continue to hear (and increasingly so) as a potential San Antonio signing as the 2017-18 season gets under way: LeBron James. A few weeks ago on a podcast with Danny Leroux, SI’s Ben Golliver discussed the possibility of James leaving Cleveland for San Antonio. CBS Sports’ Matt Moore mentioned it on his podcast, as well as in this piece looking at the 2018 free agent landscape, and it was also addressed (rather skeptically) in Thursday’s ‘Good Morning It’s Basketball’. Still, as someone who’d kept this scenario to himself for the last few months (I’m trying to become a better cynic), seeing it evaluated realistically on those channels represents a step towards plausibility. And there are plenty of reasons to see this as the best-possible timeline, for all parties involved. I won’t attempt to put myself in James’ shoes here — he’s too self-aware, unpredictable as both a player and businessman; and he’s probably the best storyteller the game has seen. That last point, however, is critical when it comes to the free-agency decisions he makes. James has built and cultivated a legacy in his own image like few athletes before him, not only altering the fates of two franchises but upsetting the landscape of the entire league. He delivered a championship to his home state, ended Cleveland’s title drought, helped bring superteams into the mainstream, and chiseled his face on the NBA’s Mt. Rushmore, just as everyone predicted but nobody believed. That said, the league’s not his anymore. That changed the moment Kevin Durant used his agency to shift power to the Bay Area. He won’t likely take it back in Cleveland, the organizational equivalent of the This Is Fine Dog, and it doesn’t seem like either LA team or Philly could offer any meaningful way to build upon a career so focused on winning. San Antonio could. It’s not just that he’d be in the best position to contend by taking his talents to South Texas; he would also be binding his legacy to that of the best coach of his time. That’s an intriguing narrative in itself—-but what if it became even more urgent? There’s the distinct possibility that Gregg Popovich finally hands his clipboard over to assistant coach Ettore Messina following the 2018-19 season, when both of their contracts are up. If James, ever the bard, were to catch wind of that year being Pop’s last, the opportunity to head to San Antonio, if only on a one-year deal, could be even more inviting. Not to mention what other players would want to join him. On paper, the fit is an easy sell. 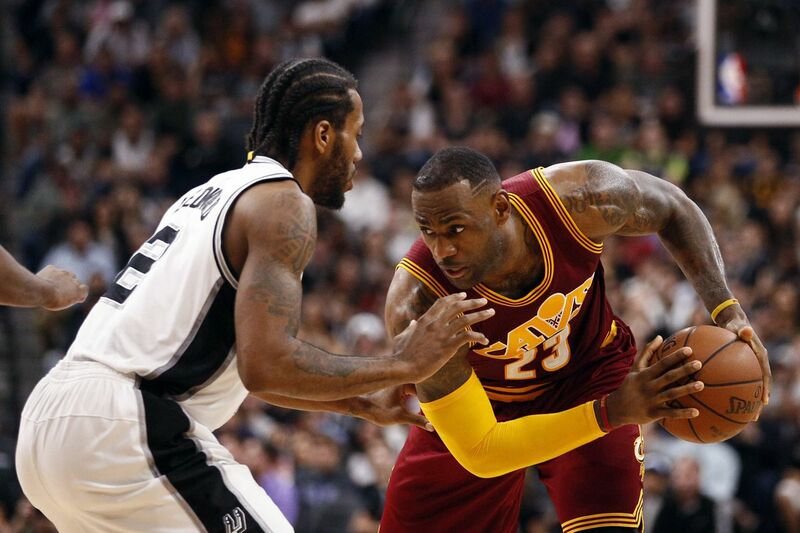 LeBron + Pop + Kawhi would make for one of the most compelling trinities the league has seen: the game’s greatest mind paired with two of the league’s best, most versatile wings. Even with the many rising talents around the NBA, it’s hard to conjure up any team so equipped to contend with the Warriors. This is all likely much ado about nothing, the infectious result of some mid-summer reverie as we brace ourselves for a season where Golden State is expected to further widen the gap between themselves and the next-best team. Even if this idea evolves from whatever it is now to a full-fledged rumor of “mutual interest,” superstar movement is still impossible to predict and rarely fits a pre-established narrative so nicely. The desire to appease expectations rarely ranks high on the list of priorities, otherwise Durant would currently be in D.C. Or still in OKC. Then there are the personalities at play. Yes, the Spurs are approaching a rare moment of flexibility and spending power, but will they match other teams’ enthusiasm in luring one of the game’s all-time greats? And is James actually prepared to leave Cleveland a second time, go West, and fall into a more hierarchical organization once again? Lastly, what’s to say James doesn’t engineer his own move, either in the middle of the season or as a sign-and-trade next summer? Individually, none of these concerns should be enough to pump the brakes on what would be a home-run move, but they may collectively. Everything can change in a year, and we’re most certainly getting ahead of ourselves with this level of speculation. But that’s the best place to be in order to avert future disappointment — or to cast a double jinx. I still haven’t figured out what I’m doing here. I’m just no good at being a cynic.